Buried for centuries, the secrets of Britain's past are hidden beneath our streets. Archaeology teams dig and dig and dig, and yet there is always more to be discovered. You can make discoveries for yourself during this year's Festival of Archaeology 2013. 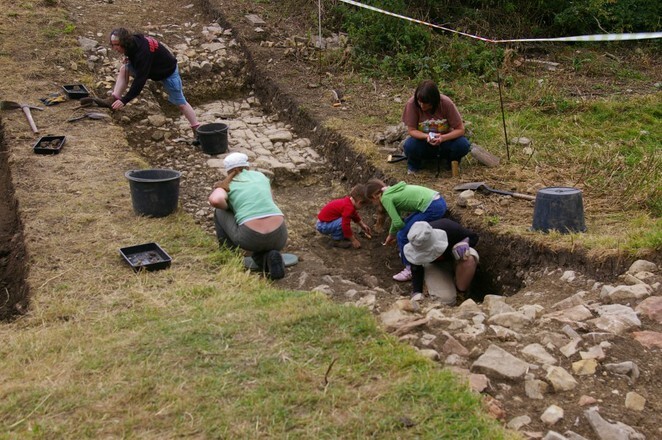 There are over a thousand activities going on across the UK between the 13th-28th July such as hands-on workshops that include pottery, calligraphy, and archery, as well as the opportunity to volunteer and take part in excavations. There will also be talks, exhibitions, open days, tours, and lots more. Browse and handle a display of archaeological artefacts that were discovered under Wandsworth's Southside Shopping Centre, and try on some Roman armour. Visit the Roman Bath House and Anglo-Saxon Cemetery fun family activities and a historical trail. The Rose is planning an archaeological dig conservation display the most important of Elizabethan theatres. Although the project won't start until 2014, it is a chance to see what is being planned. There will be a number of archaeology-themed events including a conservation exhibition, and afternoon tea. As well as guided tours, the day will also be an organ recital, and an organ workshop. Learn about the science of sound, and how to play. You need to book in advance by calling 020 7359 4019. You will be able to have a go at dowsing, a technique using a forked stick to search for water and mineral deposits. Take a tour beneath the London Canal Museum and visit the Victorian ice wells. Learn about the conservation of the site, and the ice trade from Norway to King's Cross between 1857-1904. Gallery talks by Katharine Hoare at the British Museum. The Egypt Exploration Society are running film screenings, open house tours, and lectures. In a guided tour around Lumley Chapel you will see the remains of tenth century Saxon fabric, monuments, and the resting place of the John Lord Lumley and his family. Visit the Museum of Richmond and discover some fascinating finds. Get an exclusive behind the scene tour of stores and laboratories at the Museum of London and the London Archaeological Archive and Research Centre. You need to book in advance by calling 020 7001 9844. A drop in day at the Museum of Richmond will be fun for the whole family, with Roman artefacts, replica costumes, and games. Visit the Merton Priory Chapter House for one of its rare open days. It was one of the country's most important monastic houses before 1538, where Thomas Becket trained, the Statutes of Merton were formulated, and Merton College Oxford founded. Displays, talks, family activities, and access to the Tower's river foreshore for a hands-on archaeology dig. Visit the Carshalton Water Tower & Hermitage for a tour of the 18th century orangery, saloon, bathroom, and pump chamber. Take a Shakespearean-themed guided tour around the streets of Shoreditch. Explore the theatres, plays, and people of the sixteenth century. Learn how to sort and identify archaeological objects on the foreshore of the River Thames. The day will include three talks, lunch, and a tour. See and learn about the human remains found in the River Thames. Get exclusive access to the Tower of London Beach for a guided walk & talk. Children can explore Benjamin Franklin House, learn about its archaeological history, the history of medicine, discover why human bones were found in the basement, and create their own excavation pit. Take a tour of All Hallows by the Tower, starting with an introductory session in the Crypt Museum. Your guide will cover nearly four hundred years of Roman rule before taking you to some of the best preserved stretches of the Roman city wall, Forum, Basilica, Amphitheatre, and Fort. The tour will end at the Museum of London. Fun activities for kids with an archeological sandpit dig, and other activities, where they can collect stickers. If you live outside London, check out what's going on near you.